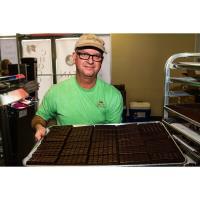 Chester, VA - Steve and Kim Taylor are producing bean-to-bar chocolate at their factory, Taylor Made Chocolate, in Chester, Virginia, a southern suburb of Richmond, Virginia. Their chocolate shop is located at Rivers Bend South Shopping Center, near the intersection of Rt. 10 and I-95, just west of Hopewell VA, where they hope to capture the attention of the 84,000 vehicles a day that pass through the area.